Shanley House Center for the Arts Address: 224 N. Travis Street City: Granbury State: Texas Zip Code: 76048 Phone: 817-579-7656 Description: Home of the Lake Granbury Art Association. The Shanley House offers art shows, sales and classes. Founded in the 1860s, Granbury started as a square and log cabin court house. Many of the buildings on the square are now registered historic landmarks, including the Granbury Opera House, which still hosts Broadway productions. The city name originated from the Confederate General Hiram B. Granberry. 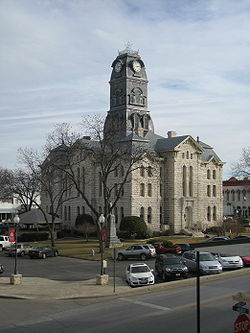 Some scholars believe his name was misread as Granbury on a document, thus the city name is spelled differently, but recent findings have concluded that Granberry chose to spell his name Granbury. Recent expansion of the city was possible from the damming of the Brazos River in 1969, which formed Lake Granbury, a long, narrow lake which flows through the city. Granbury and Hood County are rich in Texas history. David (Davy) Crockett's wife, Elizabeth, settled in Hood County following the Texas Revolution against Mexico. Crockett, as well as other Alamo participants, received land grants. The Crockett family received land in what is now Hood County. Elizabeth Crockett is buried in Acton State Historic Site, the smallest state park in Texas. A large statue of Elizabeth Crockett marks her grave site. Several of Crockett's descendants still reside in Hood County. John Wilkes Booth, according to Granbury legend, moved to Hood County and assumed the name of John St. Helen. There is a store on the historic town square that is still called St. Helen's.